Back in 2014, Questionmark produced a white paper covering what at the time was a fairly specialist subject – what assessment organizations needed to do to ensure compliance with European data protection law. With the GDPR in place in 2018, with its extra-territorial reach and potential of large fines, the issue of data protection law compliance is one that all assessment users need to consider seriously. Myself, Questionmark Associate Legal Counsel Jamie Armstrong and Questionmark CEO Eric Shepherd have now rewritten the white paper to cover the GDPR and published it this week. The white paper is called “Responsibilities of a Data Controller When Assessing Knowledge, Skills and Abilities”. I’m pleased to give you a summary in this blog article. An awarding body that gives certification exams. Data Processors are typically companies like Questionmark that provide services to assessment sponsors. Data Processors have significant obligations under the GDPR, but the Data Controller has to take the lead. Back in 2014, we considered there were typically 12 responsibilities for an assessment Data Controller. Our new white paper suggests there are now 19. The GDPR significantly expands the responsibilities Data Controllers have as well as makes it clearer what needs to be done and the likely penalties if it is not done. The white paper is useful reading for anyone who delivers tests and exams to people in Europe – whether using Questionmark technology or not. Although we hope it will be helpful, like all our blog articles and white papers, this article and the white paper are not a substitute for legal advice specific to your organization’s circumstances. You can see and download all our white papers at www.questionmark.com/learningresources and you can directly download this white paper here. Is Safe Harbor still safe for assessment data? A European legal authority last week advised that the Safe Harbor framework which allows European organizations to send personal data to the US should no longer be legal. I’d like to explain what this means and discuss the potential consequences to those delivering assessments and training in Europe. According to European data protection law, personal data such as assessment results or course completion data can only leave Europe if an adequate level of protection is guaranteed. All organizations with European participants must ensure that they follow strict rules if they allow personal data to be transferred outside Europe. Data controllers can be fined if they don’t comply. A few countries, including Canada, are considered to have an adequate level of protection. But in order to send information to the United States and most other countries outside Europe, it’s necessary to ensure that each data processor who has access to the data guarantees its protection. This includes every processor and sub-processor with access to the data including data centers, backup storage vendors and any organization that accesses the data for support or troubleshooting purposes. Even if data is hosted in Europe, the rules must still be followed if there is any access to it or any copy of it in the US. There are two main ways in which US organizations can bind themselves to follow data protection rules and so be legitimate processors of European data: the EU Model Clauses or Safe Harbor. The EU Model Clauses are a standard set of contractual clauses, several pages long, which a data processor can sign with each data controller. Signing signifies a commitment to following EU data protection law when processing data. These clauses cannot be changed or negotiated in any way. 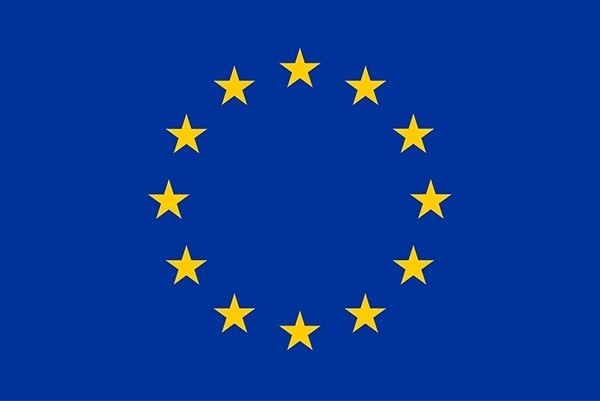 Questionmark uses these EU model clauses with all our sub-processors for Questionmark OnDemand data to ensure that our customers will be compliant with EU data protection law. An alternative to the EU model clauses in the US is Safe Harbor. Safe Harbor (formal name – the US-EU Safe Harbor Framework) is run by the US Department of Commerce and allows US companies to certify that they will follow EU rules for EU data without needing to sign the EU model clauses. You can certify once, and then it applies to all your customers. It’s very widely used, and most large US organizations in assessment and learning are Safe Harbor certified, including Questionmark’s US company, Questionmark Corporation. You can see a full list at http://safeharbor.export.gov/list.aspx. There is some concern, particularly in Germany, that Safe Harbor is not well enough enforced, so some organizations like Questionmark also use the EU Model Clauses. For example, Microsoft offer these for their cloud products. But Safe Harbor is widely used to ensure the legality and safety of European data sent to the US. Last week, the advocate general of the Court of Justice of the European Union made a ruling that the Safe Harbor scheme should no longer be legal. He argues that the widespread government surveillance by the US is incompatible with the privacy rights set out in the EU Data Protection directive, so the whole of Safe Harbor should be invalidated. His ruling is not yet binding, but rulings by advocate generals are often confirmed and made binding by the court, so there is a genuine threat that Safe Harbor could be suspended. Negotiations on data protection are underway between the US and Europe, and it is likely that this will be resolved in some way. But there are significant differences in attitude on data protection between Europe and the US. Much anger remains about Edward Snowden’s revelations about US surveillance, so the situation is hard to predict. It’s likely that a deal will be found and that Safe Harbor will remain safe. And if it is ruled illegal, this is going to affect the whole technology sector, not just learning and assessment. But it’s a further argument to use a European vendor for assessment and learning needs and/or one who is familiar with and has their suppliers signed up to the EU Model Clauses. For more information and background on data protection, see Questionmark’s white paper: Responsibilities of a Data Controller When Assessing Knowledge, Skills and Abilities. John Kleeman will also be presenting at the Questionmark Conference 2016: Shaping the Future of Assessment in Miami, April 12-15. Click here to register and learn more about this important learning event. Where do you deliver assessments from in a post-PRISM world? Like many of you, I have been watching with interest revelations about government Internet surveillance initiatives. Technologically and legally, none of it is surprising. Businesses and governmental organizations around the world have frequently expressed concerns about the data privacy implications of the US Patriot Act. Indeed, many of our customers cite data protection issues as factors in their decisions to opt for the Questionmark OnDemand service based at our European data centre. Practically, I am torn between admiring our governments defending us against terrorism and pondering Benjamin Franklin’s saying that if you give up liberty for security, you lose liberty. Wherever you stand on this issue, there are still questions to address about the practical implications this data protection challenge poses for those delivering assessments. 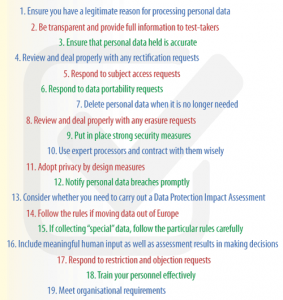 I thought it might be helpful to look at a couple of different scenarios and suggest data protection requirements you might look for when running assessments over the Internet. 1. Contract with a US service provider with confidentiality clauses. 2. Data centre and assessment results located in the US. 3. Data centre certified and audited to SSAE 16, the expected standard for quality data centres in North America. 4. Service provider and data centre operator certified under the U.S. Department of Commerce’s Safe Harbor Framework. This means they promise to comply with European data protection rules for data coming from Europe. Without this, you will have HR challenges testing your employees in Europe. With a lot of testing in Europe, you may want to look for stronger measures than Safe Harbor – see the White Paper (complimentary with registration): Responsibilities of a Data Controller When Assessing Knowledge, Skills and Abilities. 5. Vendors must have strong IT security including the latest SSL/TLS encryption and other technical measures. 1. Contract with a European service provider with confidentiality and data protection clauses. 2. Data centre with assessment results and personal data located inside the European Union. 3. Data centre certified and audited under ISO 27001, the expected standard for quality data centres in Europe. 5. Again, all the legal data protection needs to be accompanied with good IT security. See our security comparison document for some questions to ask. White Paper (complimentary with registration): Responsibilities of a Data Controller When Assessing Knowledge, Skills and Abilities. Questionmark can meet both these needs. You can visit our website to learn how Questionmark OnDemand — US-based or EU-based — offers trustable solutions for either of these scenarios. What organizational and technical measures are appropriate in assessment delivery? One of the key responsibilities of an assessment sponsor acting as data controller under European Law is to implement appropriate technical and organizational measures to protect personal data. But what does appropriate mean? And when you contract with a data processor to deliver assessments, you must ensure that the processor implements appropriate measures. But again what does appropriate mean? Measure Questionmark OnDemand? Your system? I hope this helps you work out what measures might be appropriate for your needs. If you want to learn more, then please read our free-to-download white paper: Responsibilities of a Data Controller When Assessing Knowledge, Skills and Abilities [requires registration]. If you are interested in seeing if Questionmark OnDemand could meet your needs, see here for more information.